The application of adeno-associated virus (AAV) and adenovirus (AdV) gene therapy has become increasingly important as a therapeutic modality since its first application in humans in 1990. However, over the past 20 years, the field has matured, and tangible clinical outcomes have been achieved in a limited number of studies. Establishing proof of concept and overcoming some of the technical challenges and establishing safety are the focus of preclinical studies on gene therapy to date. 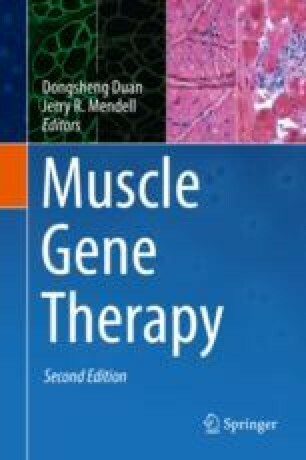 Gene therapy has been extensively investigated for some metabolic myopathies such as Pompe, but it has just begun for many others. This chapter will evaluate animal models for future research in metabolic myopathies as well as preclinical gene therapy trials for glycogen storage diseases (GSD) I, III, and V, Barth syndrome, Friedreich’s ataxia, and very long-chain acyl-CoA dehydrogenase (VLCAD) deficiency . These animal models will provide a great opportunity to test novel forms of gene editing and gene replacement therapies.